Today is a day that I Reflect. I have a life with noise I can ignore, and frustrations I can push aside, and plans that I can still make. Last year, I was sitting in my hospital room, packing my things to head home to an uncertain future medically, physically and emotionally. I watched the 10th anniversary footage of the attacks, with just as much horror as I did the day it happened. 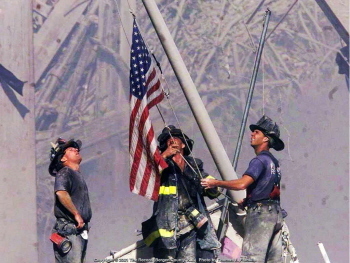 It gave me great strength to think of the courage that we as Americans had on September 11, 2011. If we as Americans could forge ahead, and be brave, then I too could forge ahead and beat Guillain Barre. I was at Schnader Harrison law office in Center City Philly that cool, sunny morning at our “Breakfast Club” Meeting, a standing meeting every Tuesday for a year with the Host Firm of the Mid-Atlantic Venture Conference. I was the Executive Director of the Greater Philadelphia Venture Group, and our organization hosted entrepreneurs each year in the hopes of their raising venture financing. With me, that Tuesday, were the two Schnader partners, the Director of the Conference, and our AV expert. We were talking about the stadium style seating that we were building- the cost, the effectiveness, the plan. Would it work? Would the entrepreneurs be happy? Would the sponsors think this was cutting edge? In the midst of it all, my cell phone started to ring. Back in 2001, cell phones weren’t what they were today when everyone’s phone is always buzzing. It was my brother. I hit ignore. Then a few moments later, it buzzed again. Not sure why Bobby was calling again, but surely it could wait. It was 9:00am, and I was in a meeting. The Partner’s admin came in to tell us that a small plane, probably a commuter plane, veered off course and hit the World Trade Center. That’s odd. We all stopped. Looked at each other. Should we be worried? Is there something going on? Nah. Back to the schematics, the plans, the presentations. My phone rang again. I stepped outside since it was my Dad calling this time. “Suz, another plane just hit the other Tower”. I walked back into the conference room, and told the group, “Another plane hit the second Tower”. We all sat there. My hands and legs started to shake. Panic started to set in. We immediately started calling family and friends in NY. I excused myself with my colleague, and we went to the lobby of 1600 Market Street where the TVs were showing our worst fears. We were under attack. Carolyn and I took off running down 15th street to our office at the Bellevue. We found the rest of the staff at the Chamber of Commerce huddled around TVs, many of us in the President’s office waiting for news. I looked at my staff, and quickly decided that home was where we needed to be. We hugged each other tightly, and ran to our cars. When I got home, I woke up my best friend Katherine, who had worked the night shift, and stuttered that we were attacked. NY was attacked. The Pentagon was attacked. What else was coming? For the next several hours, we were glued to the TV, barely speaking, and watched the Towers collapse, and Americans die. Everything changed that day. Everyone remembers where they were that day. What they were doing. How they felt. We all lost someone. Now, for me, American symbols have more meaning. They carry more pride. I tear up now when I hear or sing the National Anthem. When I walk by someone in the military, I stop and say Thank You. So, every September 11, I take the day to remember how lucky I am to have another day to fight, to laugh, to love. Yes you are an inspiration, keep fighting Susie, stay strong!! God Bless!! 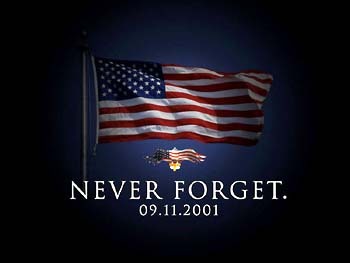 We will never forget, God Bless America!! !